In 1993 Sandberg became Managing Director, EMEA for ComStream, a San Diego-based satellite communications systems company, and was responsible for growing regional operations including the setting up of an office in Moscow, Russia. He was then with ACT Networks prior to starting Paradigm Communication Systems in 1996, where he has spent the past 16 years as Managing Director. Mr. Sandberg, you have built Paradigm through an adherence to high standards of customer support, a reputation for engineering excellence as well as responsiveness to customer needs. Would you please tell our readers of the Companys history and how you came to found the company? The philosophy behind Paradigm, then as well as now, is to add value to our customers. Paradigm is responsive to the many challenges that are placed in front of us. We assist customers in improving their existing products through the application of optimal solutions to their network and SATCOM communication needs. These solutions are based around functionality, performance, reliability and service and are the values at the heart of Paradigms ethos and business model. What are the primary solutions provided by Paradigm, and to whom are such services targeted? There are three key areas to Paradigms businessSATCOM Terminals, Earth stations and SATCOM Product Distribution. Terminals can be fixed or transportable and we typically have targeted a number of market verticals, such as Military/Government, Broadcasting, Network Operators, Oil & Gas and Service Providers. Our expertise in hub and remote systems allows us to better understand the complete system and to advise our clients accordingly. Its not surprising that some of the requirements are duplicated between sectors, particularly when you consider mobility and the nomadic side of deployable SATCOMs. For example, government, first responder/disaster recovery, oil exploration, newsgathering and emergency network communications have many common key requirements. There are, however, many important differences between these sectors and its vital to understand the fundamental distinctions between them. To supply the best solutions we need to know how the solutions will be used and how they need to work, in addition to how the system/solution needs to be supported and delivered to really add value to these customer groups. With customers within the same user segment also doing things differently, it is important for Paradigm to customize and tailor solutions to provide viable solutions to address fit their requirements. How will military sectors budget cuts impact global, as well as your Companys, business opportunities? We see significant opportunities in Europe as well as globally for Paradigm. The marketplace is leaner and, to some extent, our ethos of delivering cost effective service is holding us in good stead as budgets are scrutinized. Scalability and flexibility are critical to our Government clients. With a significant portfolio of dual band, tri-band, and quad band terminals, we think we are ideally placed to provide migration paths from X- and Ku- now, to Ka-band in the future. IBC 2012 has just concluded. What products and/or technologies did Paradigm bring to the show in Amsterdam? Were there any new product or project announcements? We had gone into IBC2012 having just released announcements on our extensive work that included a tailored network management and control system on the new state-of-the-art, multiband antenna farm for Sky News Arabia. In addition, Inmarsat released an announcement the day before the show that named Paradigm as one of the Launch Partners for Inmarsat GX Land Terminals. There was definitely a heavy Ka-band flavor to the show and having both hub and terminals to present lends itself to some interesting and open discussions with existing and potential customers. We also launched our LiteComm platform at the show. Initially developed to meet a specific government customer need, LiteComm is ideally suited to the broadcast sector as it provides the necessary common interface, its easy to carry, and also discreet. As SATCOMs push ever further forwards in deployed environments, more important than ever before is network management and client ease of use. How is Paradigm building products and solutions to ensure a seamless rollout of new technologies? Our focus is on making a simpler operator interface that is independent of specialized skillsthis means there is less need for training on the terminal itself. In recent years, deployed SATCOM has moved further forward in terms of its operational usage. To assist unskilled and untrained users, we identified that a more logical and common interface to SATCOM terminals was required. We developed a terminal GUI called PRTM. This system enables the operator to easily deploy and stow the managed terminal. This guide also takes the operator through a process to unpack, setup, deploy, align, optimize, stow and pack away, as well as aid with logical fault identification. The system was designed to contain the ability to have a pre-defined work order loaded into it, this incorporates a service transmission profile with the link budget defined specifics to really ease the process and reducing the chance of human error. It further enables use by non skilled users and simplifies training requirements. Customer feedback has shown that PRTM also provides an additional capability for tactical terminals provided as an Urgent Operational Requirement (UOR). If the operator is familiar with the PRTM GUI, they require less operator training on a UOR terminal that comes with PRTMits already preconfigured with defined parameters. It is this focus on real added value at the heart of Paradigms capabilities that enables users to focus on their real tasks, making operational projects simpler and providing our customers with complete solutions. Paradigm and Inmarsat Global Xpress created quite a stir when you were announced as a GX Land Terminal Launch Partner earlier this year. Were you surprised? Or, was this a pleasant culmination to many months of inter-company work? How is the Paradigm work moving this project along? We werent surprised at the announcement, as with any large scale technology driven agreement there is significant work involved behind the scenes to bring elements together. Our GX Agreement was no exception. As an existing provider of L-band services to the Military and Government sectors, we were already used to working with Inmarsatall the discussions went very smoothly. Paradigm has extensive knowledge of the global VSAT arena and has implemented Ka-band systems from 60cm up to 4m, including site installation and testing. Alongside our relevant RF expertise, we are also a Global iDirect Distributor and Preferred Solutions Partner. Providing existing integration and support of iDirect allows us to seamlessly support the use of iDirect as the Core Module for Inmarsat Global Xpress moving forward. Is the Paradigm technology different from that offered by the competition? If so, how? And why should the Paradigm product be considered over that of other solutions? We like to add value and simplify the operators usage of our systems. The technology used in the GX terminals is based around industry proven elements of RF, Satellite Routing and Reflector. However, the real value add by Paradigm is our approach to the complete systemTerminals, Documentation and Training all contribute together. This value-add capability further enhances the high data rate and mobility orientated services that can be delivered over Inmarsat GX. We further operate Europes largest SATCOM product warehouse and can add our experience in providing distribution to the mix. As new technologies evolve and applications are acquired by mil/gov concerns across the globe, how do you think Paradigm is positioned to take advantage of these various markets? We are ideally positioned as we are vendor independent, able to add value and customize our solutions to blend new and industry proven technologies with ease. Paradigm are very flexible and able to adapt solutions quite quickly to a high standard. We act as an unofficial beta test facility for many leading technology vendors. This allows us to get our hands on new technology and provide feedback to manufacturers, ensuring that we provide robust solutions to our customers. The SATCOM industry is constantly evolving and being at the forefront of new technology rollout needs to be combined with the ability to deliver product to meet Military and Government operational requirements. This is where we are strongest as a company. Can we expect to hear about new Paradigm technology efforts over the next few months? Certainly. Weve been working on hybrid solutions for L-band backup to our existing X-, Ku- and Ka- terminals. We love and thrive on change and there is plenty of that going on at this moment in this industry. 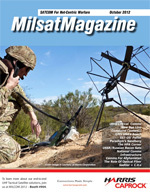 What challenges do you believe confront the MILSATCOM industry over the near year or two, and how do you feel such should be addressed today in preparation for these events? The next few years are going to be extremely interesting. With several new Ka-band satellites being launched, all with differing payloads and potentially different target applications, its an uncertain time for the traditional MILSATCOM industry. At Paradigm, we are excited to see such challenges. Some people talk about there being a future glut of bandwidth with Ka-band, but we dont agree that such is happening. As these new satellites come online, end-users will devise new ways to use SATCOM and the attendant applications. Consider the impact UAVs have had on the militarys use of commercial SATCOM. Looking back over your career, are there any projects or products, in particular that bring a true sense of satisfaction to you? As our whole company ethos is to add value to the customer, something that is easy for us to implement might be a game changer. Some of our work for our military customers in deployed environments has been particularly rewarding. The Inmarsat effort from Paradigmprobably the complete system we delivered to Sky News Arabia for their state-of-the-art antenna farm truly showcased our capabilities The project was delivered on time and on budget, with some game changing value adds introduced to the project during final rollout. From RF design and engineering, project management, logistics and shipping, through to bespoke software design, RF certification verification and testing, this was a successful test of Paradigms integrated capabilities. The project in its entirety was shortlisted for the Innovation Award at IBC this year.